Nuage (or commonly known as chromatoid body in mammals) is a conserved germline-specific organelle that has been linked to the Piwi-interacting RNA (piRNA) pathway. piRNAs are a class of gonadal-specific RNAs that are ~23-29 nucleotides in length and protect genome stability by repressing the expression of deleterious retrotransposons. More recent studies in Drosophila have implicated the piRNA pathway in other functions including canalization of embryonic development, regulation of maternal gene expression and telomere protection. We have recently shown that Vasa (known as Mouse Vasa Homolog in mouse), a nuage component, plays a mitotic role in promoting chromosome condensation and segregation by facilitating robust chromosomal localization of condensin I in the Drosophila germline. Vasa functions together with Aubergine (a PIWI family protein) and Spindle-E/mouse TDRD-9, two other nuage components that are involved in the piRNA pathway, therefore providing a link between the piRNA pathway and mitotic chromosome condensation. Here, we propose and discuss possible models for the role of Vasa and the piRNA pathway during mitosis. We also highlight relevant studies implicating mitotic roles for RNAs and/or nuage in other model systems and their implications for cancer development. Germline granules were first described in rat spermatids more than 100 years ago and were subsequently named "chromatoid bodies" in mammalian cells [1, 2]. They were later found to be widely-conserved in germline cells of many animals, where they are referred to as "nuage" and "P granules" in Drosophila melanogaster and Caenorhabditis elegans, respectively [3, 4]. Under the electron microscope, germline granules appear as electron-dense fibrous structures, are not bound by any membrane and localize to the cytoplasmic peri-nuclear region . Since their discovery, germline granules have remained mysterious due to the fact that their precise function has not been identified. Recent studies in Drosophila have linked these germline granules (hereafter referred to as nuage) to a novel class of small non-coding RNAs known as Piwi-interacting RNAs (piRNAs). piRNAs are a class of gonadal-specific RNAs that are ~23-29 nucleotides in length and produced in a Dicer-independent manner [5–9]. They are mainly derived from transposons or repetitive sequences that are clustered in the peri-centromeric and sub-telomeric regions of the chromosome [10, 11]. Interestingly, many proteins that are required for the biogenesis of piRNAs are found to localize to the nuage. For example, in Drosophila, the PIWI subfamily proteins, Aubergine and Argonaute3, which bind piRNAs, are components of the nuage [11–14]. In mouse, the PIWI family proteins, MILI and MIWI, also localize to the chromatoid body . In the Drosophila nuage, Aubergine and Argonaute3 are believed to function in a secondary piRNA amplification pathway known as the "ping-pong" cycle in germline cells [11, 15]. Other germline piRNA pathway proteins, such as Vasa (Mouse Vasa Homolog), Spindle-E (mouse TDRD-9), Krimper, Maelstrom (mouse Maelstrom), Cutoff (yeast Rai1) and Tejas (mouse TDRD-5 and TDRD-7), also localize to nuage although their exactly molecular function in piRNA processing remains unknown [16–20]. Of note, some piRNA pathway components (Piwi, Rhino and Armitage/mouse MOV10L1) do not localize to nuage, but play a role in the primary production of germline piRNAs [21–24], and Maelstrom has an additional role in the nucleus to regulate germline stem cell differentiation . The first identified role for the piRNA pathway is to repress deleterious retrotransposons and the repeated Stellate elements in the Drosophila germline [8, 26, 27]. This process appears to occur in part at the transcriptional level involving Piwi as the effector protein to promote heterochromatin formation [28–30]. It has also been proposed that post-transcriptional silencing of retrotransposons occurs at "pi-bodies" - cytoplasmic nuage in conjunction with Processing body components . As germline cells function to give rise to the next generation, it is not difficult to imagine that they would adopt multiple mechanisms to protect their genome integrity. Recent studies have shown that the piRNA pathway functions not only to repress transposons but also to regulate embryonic development and telomere protection. Studies of Heat Shock Protein 90 (Hsp90) and Piwi have linked the piRNA pathway to the canalization of embryonic development by consecutively suppressing genetic variation via an epigenetic mechanism and silencing transposon activity [32, 33]. The piRNA pathway has also been shown to regulate deadenylation and decay of maternal mRNAs in the embryo , therefore implicating additional functions of the piRNA pathway outside the germline. Besides regulating gene expression, another emerging role of the piRNA pathway is to protect the telomeres by regulating the telomere capping complex and telomere length [35, 36]. Therefore, we are only beginning to understand the functional roles of the piRNA pathway in various biological processes. We recently reported that in Drosophila, Vasa, a piRNA pathway component, promotes mitotic chromosome condensation and segregation by facilitating robust chromosomal localization of two condensin I components: CAP-H (also known as Barren in Drosophila) and CAP-D2 . Condensin complexes are major regulators of mitotic chromosomes that promote robust chromosome condensation and segregation [38, 39]. vasa encodes a RNA helicase that is specifically expressed in germline cells [12, 40]. Since its discovery in Drosophila, Vasa has been shown to be involved in various biological processes, including germline stem cell differentiation, piRNA-mediated transposon silencing, pole-plasm assembly, and germline proliferation [17, 40, 41]. In Drosophila, Vasa functions in part by interacting with eukaryotic initiation factor 5B (eIF5B) to promote the expression of proteins required for proper differentiation including Mei-P26 . In mouse, the Mouse Vasa Homolog has also been shown to regulate germline proliferation and piRNA-mediated transposon silencing [2, 5, 12]. We found that Vasa functions in an eIF5B-independent manner in promoting mitotic chromosome condensation and segregation in Drosophila . During mitosis, Vasa forms mitotic bodies with Aubergine and Spindle-E (two other piRNA pathway proteins) and binds to piRNA-generating chromosomal loci at the peri-centromeric regions (Figure 1). In the piRNA pathway mutants, aubergine and spindle-E, chromosomal condensation and segregation were defective and concomitantly mitotic localization of Vasa is abolished. This suggests a link between the piRNA pathway and mitotic chromosome configuration. Furthermore, Vasa associates with CAP-H and CAP-D2, implying a direct role for Vasa in regulating their chromosomal localizations. The dynamic localization of Vasa during mitosis in Drosophila germline stem cells. During interphase and prophase, Vasa (green) localizes as peri-nuclear bodies in the cytoplasm (nuage). When the nuclear envelope (dark blue line) begins to break down during prometaphase, Vasa gets access to the chromosomes (red) and localizes as peri-chromosomal bodies. This continues until metaphase. At anaphase, some Vasa bodies remain near segregation chromosomes, while the other bodies are displaced in between the segregating sister chromatids. NC: nucleus, Vas: Vasa. How does Vasa regulate condensin I localization? We hypothesize that Vasa may directly function to promote recruitment of condensin I during mitosis (Figure 2). This model is favored because it has been shown that during mitosis, CAP-H loading begins at centromeric regions and subsequently spreads distally towards the chromosomal arms . During mitosis, Vasa localizes near peri-centromeric piRNA-generating loci possibly via Aubergine-bound piRNAs. This localized region consisting of Vasa (and also Spindle-E) promotes recruitment of CAP-H to the chromosomes. Our studies on the genetic and physical interaction between Vasa and condensin I components also support this model. It would be interesting to test the functional significance of the Vasa-CAP-H interaction to further refine this model. 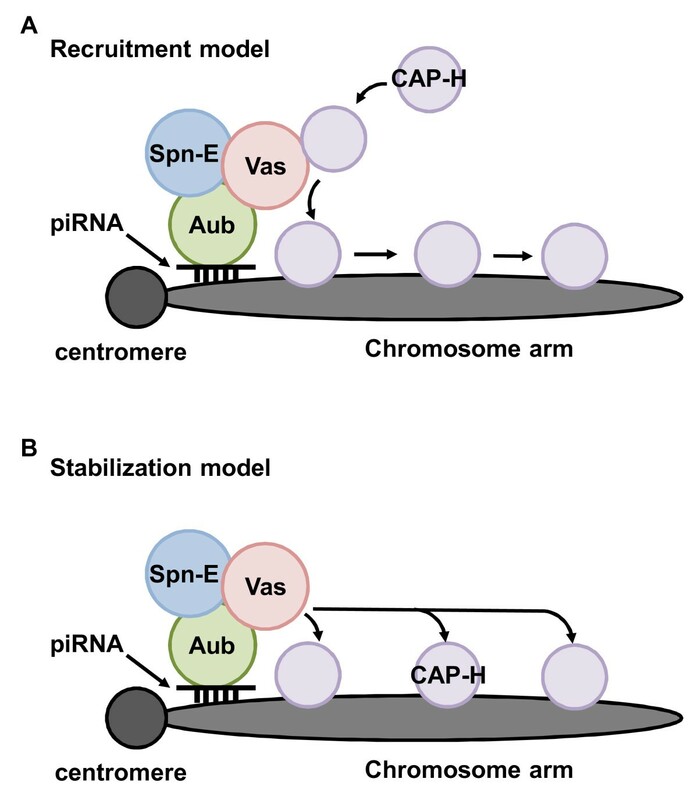 Another model which may also seem possible but is less supported is the idea that the Vasa/Spindle-E/Aubergine-piRNA complex may localize to peri-centromeric piRNA-generating loci and stabilize CAP-H chromosomal localization (Figure 2). This model supposes a long-range action of Vasa on chromosomes by an unknown mechanism. The involvement of Vasa and the piRNA pathway in germline mitotic chromosome regulation raises an intriguing question of whether an analogous pathway performs the same function in the soma. Although experimental evidence is lacking, recent studies suggest that an analogous somatic pathway may operate to promote condensin I localization. Somatic cells contain endogenous small interfering RNAs (endo-siRNAs) which function similarly to piRNAs in repressing retrotransposons . Interestingly, some endo-siRNAs are derived from the same peri-centromeric loci that generate piRNAs , suggesting that these loci, together with the endo-siRNA pathway components, may collaborate in promoting condensin I recruitment in somatic cells. Another implication comes from a large-scale screen of localized RNAs in Drosophila embryos. A few retrotransposons (copia, Doc, and Ste12DOR) were identified to be localized onto mitotic chromosomes in developing embryos [43, 44]. Therefore, it would be of interest to examine if the endo-siRNA pathway and a Vasa-related protein regulate condensin I in somatic cells. Multiple lines of evidence for the role of germline granules and/or RNAs during mitosis have emerged over the past few years. Studies in C. elegans first demonstrated that some of the P granule (nuage equivalent) components, including Argonaute CSR-1, RNA-dependent RNA polymerase EGO-1, Dicer-related helicase DRH-3 and Tudor-domain protein EKL-1, promote chromosome segregation during mitosis by regulating proper chromosome organization in germline cells [45, 46]. These proteins may form a mitotic complex that binds to CSR-1-interacting small RNAs (22G-RNAs) and localizes to mitotic holocentric chromosomes at the 22G-RNA target loci. Therefore, the 22G-RNAs appear to mediate recruitment of proteins to the mitotic chromosomes to promote chromosome segregation. These observations are intriguingly similar to what we see in Drosophila, where we observe that the RNA helicase Vasa, the Tudor-domain-containing RNA helicase Spindle-E and the PIWI subfamily protein Aubergine all localize to mitotic chromosomes . Despite the differences between the two systems, it seems that, in general, small non-coding RNAs and germline granules appear to play important roles in organizing chromosomal configuration in germline cells during cell division. In addition to the dynamic localization of nuage/P granules during mitosis, cell cycle-dependent expression of non-coding RNAs has also been reported in Schizosaccharomyces pombe (fission yeast) and mouse [47–49]. In mouse, it was reported that satellite repeats from the pericentric heterochromatin were transcribed during mitosis, suggesting a mitotic role for such non-coding RNAs . Interestingly, non-coding centromeric satellite repeats are shown to be a component of the chromosome passenger complex (CPC) and potentiates Aurora A kinase activity in murine cultured cells . In yeast, centromeric repeats are transcribed during the S phase before the loading of condensin, suggesting that such non-coding RNAs may promote recruitment of condensin during mitosis to silence the expression of centromeric repeats in a cell cycle-dependent manner . RNAs also appear to have some function not only in chromosomal configuration, but also in spindle formation. Studies in Xenopus laevis and human cell lines have shown that mRNAs localize to mitotic spindles and appear to have a function independent of protein coding during mitosis: regulating spindle assembly [51, 52]. This further implicates the functional roles of RNAs, either short non-coding RNAs or mRNAs, in various processes, including but not limited to chromosome organization and spindle assembly, during mitosis. Piwi, a founding member of the piRNA pathway, was originally found to regulate stem cell division in the Drosophila germline . It was also reported that human and mouse Piwi homologues, Hiwi, PiwiL2, and PiwiL2-like proteins, are expressed in certain human and mouse stem cells and tumors [54–57], raising the possibility that the development of cancer may be linked to the piRNA pathway and stem cells. Using the Drosophila brain as a model system, a recent study indeed demonstrated that ectopic expression of germline and piRNA pathway genes are responsible for formation and development of brain tumors . Although the mechanisms of how the piRNA pathway promotes tumorigenesis remain unknown, these data highlight the importance of understanding the role of the piRNA pathway during somatic cell division, with the idea that this pathway may be a target for cancer therapeutics. Our recent work on the role of Vasa and the piRNA pathway in promoting chromosome condensation and segregation during mitosis provides one example of a mitotic role for non-coding RNAs. Similar roles for such non-coding RNAs have also been described in various model organisms, including yeast, C. elegans, Xenopus and mouse. Future studies would likely uncover more examples of the fascinating interplay between RNAs and the cell cycle. This research was supported by the Temasek Life Sciences Laboratory and the Singapore Millennium Foundation. JWP and TK drafted, read and approved the manuscript.